Gate systems and security fencing. 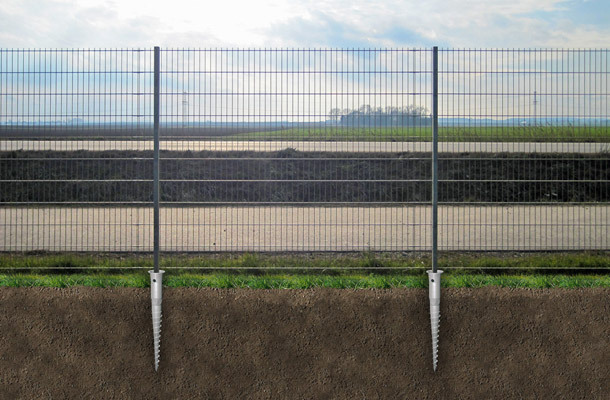 Patented eccenters and gravel systems are used in the krinner ground screw fencing foundations , providing an effective solution for all fence types. Ground screws provide precision installation, regardless of whether the terrain is flat or hilly. The krinner ground screw provides cost and time savings – there is no digging, concreting or wet trades. The ground screw is screwed into the ground and the fence is attached. There is no waiting time and the fencing is immediately secure. Whilst the ground screw is long lasting, it can also be easily removed and re-used which is ideal for temporary fencing requirements. A sustainable ground engineering solution, the ground screw is environmentally friendly and ensures the landscape is not spoilt by unsightly concrete posts.